WASHINGTON, Jan. 26, 2005 - The Green Power Top 25 list is the U.S. The U.S. Environmental Protection Agency's an annual ranking of American companies, organizations, and government institutions that have voluntarily bought the most renewable energy and are part of the EPA Green Power Partnership. EPA also announced its Green Power Partners are now purchasing more than 4 million megawatt hours of renewable energy, an increase of nearly 100% since the end of 2004. The 2006 Top 25 green power purchasers are buying enough energy to power more than 300,000 homes a year, which is also comparable to removing the emissions of nearly 400,000 cars from the road annually. More than half of the Top 25 EPA green power purchasers are comprised of U.S. corporations, a number that continues to increase every year. City of Sand Diego, Calif.
Mohawk Fine Papers, Inc 17. Mohawk Fine Papers, Inc.
Mitra recently attended the Cleantech Finance and Investment Forum in Melbourne, and reports the impact of government policy on renewable energy development and cleantech investment in Australia. At this conference were representatives from pension funds, investors, venture capital, local government and the renewable energy industry. A couple of points stood out. Contrary to what the government is saying about backing emissions reduction, speaker after speaker talked about moving their investment offshore - mostly to Europe - because of the lack of government support here. The most interesting example was Viridis Energy with investments so far in four countries in Wind, Hydro and Waste to Energy. the lack of signing Kyoto means that the carbon credit trading system doesn't bring them the ability to sell their credits on the international market. The failure to raise the Mandatory Renewable Energy Targets, which are set at the absurdly low level of 2% by 2010. Essentially both the investors, and the industry were saying that this in effect puts a cap on the renewable energy industry in Australia, so it was safer to take funds offshore. Which could help explain the connection between the similarly aggressively unaggressive US carbon policy and the fact that carbon is currently trading at $1.70 per ton of CO2 in the US and $27.53 in the EU. Related Links: http://www.cleantechforum.com/, http://www.viridisenergy.com/, http://www.greenhouse.gov.au/markets/mret/, http://cleantech.com/index.cfm?pageSRC=CleantechVentureMonitor. Local community groups, schools and not-for-profit organisations are being encouraged to apply for green grants after energy supplier Powergen extended the deadline for applications to its GreenPlan Fund. Following a call for applications, Powergen has been inundated with requests for application packs for the Fund, which allocates cash to projects that deliver renewable energy, and so it has decided to extend its deadline to 24 February. Nina Hughes, Powergen’s Community Relations Manager, said: “We’ve had such a fantastic response that we felt we really had to extend the deadline to make sure everyone gets a chance to apply. To date, Powergen, which is part of E.ON UK, has allocated over £180,000 from the fund to 12 different renewable energy generation projects throughout the UK. Projects supported include the purchase and installation of a solar-powered and wood-fired water and heating system for a wildlife conservation park in Kent and the building of a water turbine at a school in Nottinghamshire. greenplanfund@powergen.co.uk. Successful projects will be notified by March 31. The disposal of nuclear waste is a long-term problem Opponents of nuclear power have seized on an initial report which indicates that a solution to managing radioactive waste may be some way off. The Committee on Radioactive Waste Management's final report will help the UK Government decide whether or not to support new nuclear power stations. The Scottish Green Party said the warning shows the scale of the problem. The Scottish Executive said there would be no more nuclear power stations until the waste issue has been resolved. The Committee on Radioactive Waste Management is due to deliver its conclusions in July. However, the draft of its initial report states: "If ministers accept our recommendations, the UK's nuclear waste problem is not solved. "Having a strategy is a start. The real challenge follows." It is not clear whether this was a reference to the difficulty of siting a nuclear waste dump. However, the Greens have interpreted this as an admission that the problem cannot be resolved. First Minister Jack McConnell has pledged that the executive would not be prepared to consider progressing with nuclear power until the problem of nuclear waste was resolved. He said last year: "Until there's a solution to the problem of nuclear waste, I don't believe that we should be involved in further generation of nuclear power. "The solving of the issue of nuclear waste seems to me to be of paramount importance because that waste currently exists and needs to be dealt with." Options for disposal being considered by the committee are deep disposal, phased deep disposal where the waste is retrievable, shallow burial of short-lived waste and interim storage as a temporary management solution. BBC Scotland environment correspondent Louise Batchelor said: "Once the committee makes its recommendation, even supposing the government accept it and supposing it's for deep disposal, there's still the huge problem of public acceptability, finding a place to actually put it, going through the planning process and so on. "It all depends on what First Minister Jack McConnell and the executive accept as a solution." Green MSP Chris Ballance said: "The admission in this document reveals that Jack McConnell will never be able to justify a new nuclear reactor this side of the May 2007 election, and it exposes the arrant nonsense that proposals to manage the nuclear waste legacy could possibly be described as 'solving' the problem. "On top of the costs, dangers, risks and a failure to truly tackle climate change - nuclear power creates waste that is not going to be magicked away by the CoRWM report." "Nuclear power is dirty, dangerous and unwanted in Scotland, and this report only shows that our objections to nuclear power are totally justified." BBC Website is running a poll, "Should we expand nuclear energy?". Clearly the nuclear lobby knew about it first, with over 70% votes so far saying yes, but the proportion is declining as more Greens and ordinary citizens get clicking. 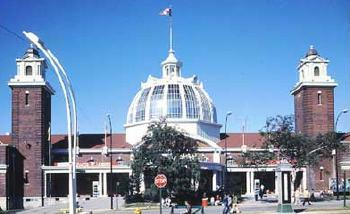 TORONTO, Ontario, Canada - The City of Toronto is poised to install the largest solar power system in Canada on the roof of the Horse Palace at Exhibition Place. Scheduled for completion in the spring, the 100 killowatt system is expected to reduce the facility’s greenhouse gas emissions by an estimated 94.7 metric tons per year. Exhibition Place, located just west of downtown Toronto along the shores of Lake Ontario, holds large-scale world-class events, including the Canadian National Exhibition, the Molson INDY, the Caribana Parade, the Royal Agricultural Winter Fair, and World Youth Dayon on its 192 acres of parkland. Each year, 5.2 million people visit the site. The city has sent a letter of intent to buy the million dollar system from Carmanah Technologies Corporation of Victoria, British Columbia, a publicly traded company. “We’re extremely pleased to be selected as the technology partner for this very important solar power project,” said Carmanah CEO Art Aylesworth. “Carmanah will provide Exhibition Place with a complete turn-key package as a model of sustainable energy for the City of Toronto." Richard Morris, manager of the energy efficiency office at Exhibition Place, told the "Toronto Star" that if all goes well, Exhibition Place will expand the solar PV system to one megawatt or more in 2007. "What we'll end up doing is just covering that entire roof to the extent we can," he said. Carmanah’s solar power system will be tied to the electricity grid. It will use high-efficiency solar modules and a unique penetrationless tracking system. An educational lobby display will show the public how much power is being produced, give environmental conditions, and offer historical system performance data. Beijing, China - China's landmark renewable energy law took effect on January 1, prompting the government to issue a number of pertinent new rules and technical criteria, according to the Worldwatch Institute. 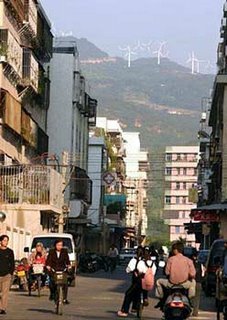 Shantou wind farm viewed from the town of Nan'ao in Guangdong Province, which is already home to several industrial-scale wind farms. The current installed capacity is 60 MW but will be increased to 200 MW. In particular, financial subsidies and tax incentives for the development of renewable energy sources -- including wind power, solar energy, biomass, and others -- are in the enactment process, said Zhang Guobao, vice director of the National Development and Reform Commission, at a press conference on January 12.Based on the "feed-in laws" that have been successful in advancing renewables in Germany and other European nations, one new regulation addresses the core issues of pricing and fee sharing for on-grid renewable energy. According to Xinhua News, the ruling stipulates two forms of renewables pricing: a government-set price and a government-"guided" price. For example, for biopower -- defined by China as energy derived from biomass, or plants -- the government will set the price based on the provincial or local on-grid price of desulfurized coal, plus a government subsidy of 0.25 yuan (US $0.03) per kWh. This subsidy will no longer be available once a biomass project has been in operation for 15 years. For all renewable power projects approved after 2010, the subsidy provided per kWh generated will decrease at an annual rate of 2 percent.For biomass projects, if the licensees are determined through a competitive bidding process, the bid-winning price will be implemented provided it does not exceed the local price of grid-connected power. The on-grid price of wind power, too, will be set by State Council authorities based on the bid-winning price. The price of solar, marine, and geothermal power projects, meanwhile, will be determined on an "economic and reasonable" basis.The cost difference between on-grid renewable power and power from on-grid desulfurized coal will be shared in the selling price at the provincial and national levels. The Chinese government endorsed the Renewable Energy Law in February 2005, driven by a surging demand for energy as well as the desire for energy security, pollution reduction and poverty alleviation. Specifically, the law aims to boost China's renewable energy capacity to 15 percent by the year 2020 and outlines a commitment to invest $180 billion in renewable energy over this period. It sets the stage for the widespread development of renewable energy in China, particularly for commercial-scale electricity-generation facilities. Other financial issues under discussion include a national fund to foster renewable energy development as well as low-cost loans and tax breaks for renewable energy projects. 01.23.2006 - ATHENS - Greek energy company PPC plans to invest 1 bln eur in renewable energy over the next 8 years, brokers said. Brokers added that PPC aims at capturing a 23 pct market share of the local renewable energy market by 2014, from its current stake on 10 pct. The company's subsidiary PPC Renewables is expected to undertake the investments which will be 30 pct subsidized by the state, brokers said. What's this about renewable energy? "I received a flyer with my utility bill last month saying I could pay an extra $3 on my future bills to get electricity generated by renewable energy. What's this all about? "You're probably wondering why someone would voluntarily pay extra on their utility bill and not receive anything direct for it. Well, it might surprise you to learn that there are currently more than 330,000 utility customers in 34 states who have signed up to do just this. These people are participating in what are called "green power" programs -- a term that refers to electricity that is either partially or fully generated from solar, wind, biomass, geothermal or other forms of environmentally-friendly renewable energy. These voluntary consumer purchases have been around since the early 1990s when some utilities started offering opportunities for their customers to help finance the use of renewable energy to help bring "green" energy to their communities. Today more than 600 utility companies have some type of green power program, giving more than half of all U.S. consumers an opportunity to buy green power from an electricity provider.You can get a complete list of all green power options available in your state at http://www.epa.gov/greenpower/locator/index.htm. You'll find the names of all utility programs in the country, links to the program information, and the types of renewable resource they use. You'll also find details of available renewable energy certificate programs, another form of buying green energy that is available to all U.S. consumers regardless of specific utility programs offered in their state. These certificates represent the "green" attributes of electricity that come from renewable energy projects.While only about 2 percent of the country's electricity comes from green power, these voluntary utility programs are helping to stimulate the development of more renewable energy projects. The 600 utilities currently offering programs are providing more than 3 billion kWh of green power annually -- enough to power 300,000 homes every year.People participate in these programs because they know their small monthly investment is helping utility companies develop renewable energy resources -- energy sources that will help meet future energy demands while helping keep our environment clean. Current programs typically allow consumers to choose to help support either a percentage of their electricity use or to buy blocks of renewable energy at a fixed price. Costs to the consumer average around 2 cents per kWh. Examples of some of the programs offered today include Alabama Power Co.'s "Renewable Energy Rate" which offers customers the opportunity to pay $6 additional each month for power generated by Alabama-grown switchgrass; Austin Energy's "GreenChoice" program that lets customers choose to receive 100 percent renewable energy generated from wind and landfill resources; a program by Colorado Springs Utilities that offers a wind power option at $3 per 100-kWh; a Golden Valley Electric Association in Alaska program that lets customers pay a small monthly fee to support the development of local renewable energy projects, and programs at Lower Valley Energy in Wyoming and Idaho that lets offers customers 300-kWh blocks of green power generated by wind and other regional programs for $3.50 each month. If you're willing to spend a few dollars extra each month to help your utility company develop clean renewable energy sources for current and future generation of electricity, programs like these let them pool lots of small donations into amounts that can really make a difference. It's easy to participate in these programs, and the environmental and economic benefits will be around for a long, long time. It's the same reason why people like me and thousands of others have bought hybrid cars. They'll probably never make economic sense for us because of their higher purchase price, but driving them will help keep our air cleaner for future generations. 1. Offshore windfarm: Kentish Flats, Thames Estuary, off Herne Bay (Elsam Engineering) - Costing £105m, this 90mw scheme is the third offshore windfarm to be built in UK waters. The project has 30 huge turbines, each measuring 90m and able to generate enough power for 3500 homes. They have been described by one windfarm builder as "the Ferrari of the turbine world." 2. Solar: CIS Building, Manchester - Originally built in 1962 as the headquarters for the Co-operative insurance company and currently undergoing a major refurbishment, including the installation of solar panels on the south, east and west of the building. Part funded by the DTI's solar grant scheme, this will be the biggest usage of solar panels in the UK. It will be fully completed in January 2006 but was officially opened by Prime Minister in November. 3. Onshore windfarm: Black Law A, South Lanarkshire, Scotland (Scottish Power) - Designed to provide green energy for 70,000 homes, this 62 turbine, 143 MW is currently one of the largest UK windfarms to have been approved. 4. Biomass: Balcas' renewable energy plant, Enniskillan, N.Ireland - This facility includes a combined heat and power (CHP) plant and an operation that produces a revolutionary new wood pellet bio fuel. It is the first biomass facility in the world to produce a renewable heating fuel using energy created by burning sawdust and wood chips. Energy Minister Malcolm Wicks officially opened the site in November. 5. Microgeneration: Spen Valley Sports Centre, Liversedge, Nr Leeds, West Yorkshire - A project developed by the student council after consultation with the local community, this mixed secondary school succesfully applied for a grant under the DTI Clear Skies scheme and was awarded half of the cost of installing a 15m / 15KW wind turbine. As well as promoting renewable energy in the locality through high visibility, data from the turbine is also used by the students for study in class. 6. Solar: Eden Centre, St Austell, Cornwall - The Eden Trust is well known for its environmentally-engineered biodomes, which provide ideal growing conditions for non-native plants. This well visited Eden tourist attraction aims to promote understanding and responsible management of the relationship between plants, people and resources. The solar panels on its new education centre are also helping to promote renewable energy. The installation was again part funded by the DTI. 7. Onshore windfarm: Cefn Croes, nr Aberystwyth, Wales (Falck Renewables) - This was the most powerful windfarm in the UK when it opened in June. A 39-turbine scheme with the potential to produce 58MW, which can supply 42,000 homes with electricity. It is estimated that it will save 4 million tonnes of CO2 emissions over its 25-year lifetime. 8. Marine: Wave buoy, north Cornwall - This £70,000, state of the art energy buoy was launched into the Atlantic Ocean in February by the Renewable Energy Agency for the South West. Designed to record wave activity and measure wave power, the project will speed up the installation of one of the world's first wave farms, which could be in place within the next three years. The buoy is sited in an area that is being investigated as a possible location for the Wave Hub - an offshore electrical socket that would be connected to the national grid by an underwater cable. 9. Solar: East Hall, the Science Museum, London - The Science Museum in London is a world-renowned exhibition centre for all types of scientific exploration and applications. A solar energy installation has been incorporated into the roof of the East Hall. The East Hall houses an internationally significant collection of early steam engines and is the first hall that visitors come to. A large energy exhibition mainly concentrating on the future of energy supply is planned and the solar energy system will be a central feature. As with the two other solar projects in the top ten, this was part funded by the DTI. 10. Microgeneration: Nissan Motor Plant, Sunderland - The first of its kind for any Nissan facility in the world, this £2 million scheme has six turbines producing 5% of the annual energy requirement of the 750-acre site. The turbines will also reduce the carbon emissions from power plants supplying the factory by 10,000 tonnes a year.